Background: Urinary bladder cancer is classified as urothelial or non-urothelial. Ninenty percent of bladder cancer are urothelial and has propensity for divergent differentiation. Squamous differentiation is associated with unfavourable prognostic features. The aim of this study is to determine the significance of urothelial carcinoma with divergent differentiation in relation to tumor stage and lymphovascular as well as perineural invasion in radical cystectomy and partial cystectomy specimen. 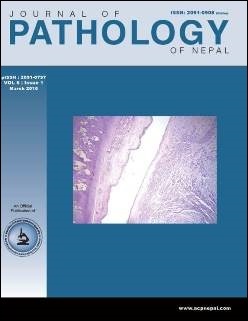 Materials and methods: This prospective study was done among 51 patients who underwent radical cystectomy or partial cystectomy at Bhaktapur Cancer Hospital from 1st August 2013 to 31st December 2015. Received specimen was grossed following standard protocol and histopathological evaluation was done in relation to tumor type, depth of invasion, Lymphovascular and perineural invasion. Results: Pure urothelial carcinoma comprises 47.1% of cases. Among the divergent differentiation, urothelial carcinoma with squamous differentiation was the commonest one (39.2%) followed by glandular differentiation (5.9%), sarcomatoid differentiation (3.9%), clear cell variant (2.0%) and squamous along with sarcomatoid variant (2.0%). Statistical significant correlation was found between urothelial carcinoma with divergent differentiation and tumor stage (p<0.012). Statistically significant correlation was also found between urothelial carcinoma with divergent differentiation and lymphovascular invasion (p=0.012) as well as perineural invasion (p=0.037). Conclusion: Most common divergent differentiation was squamous differentiation. Urothelial carcinoma with divergent differentiation was associated with higher stage and lymphovascular as well as perineural invasion. So it is mandatory to search for the divergent differentiation in urothelial carcinoma as this may be associated with unfavourable prognosis.